What's better than a cat in a bow tie? I cat in a BIRD bow tie, of course! This hip, ironic bow tie is our best selling cat tie/collar for good reason! The wonderfulness of these cute, innocent birds (right next to your feline's mouth) is just too hard to resist. The bow tie is removable, leaving a wonderful adjustable collar for your favorite small pet if you wish (please note that this collar uses a safety breakaway latch). Looking for a different material? 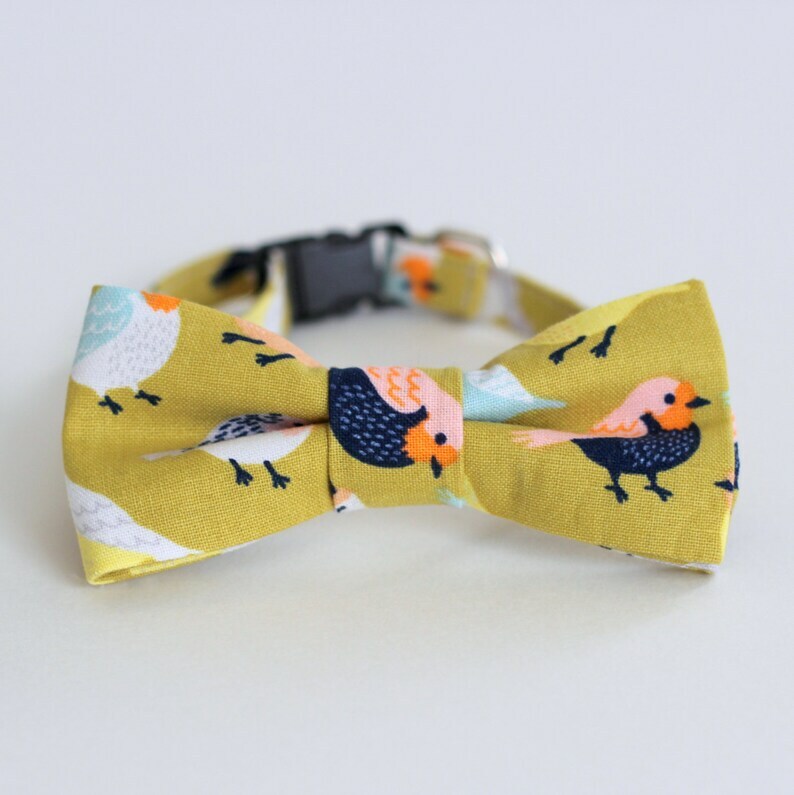 Check out the bow and neck ties in our shop, when you find a print you'd like just let us know - almost all our prints are available as pet bow ties and collars. This made to order bow tie and collar will ship within 3-5 business days. We suggest spot cleaning the bow tie and collar as needed. Cute with bow tie, although without bow tie not many bird heads show on the collar. Was hoping for better placement. Bonne qualité de tissu, envoyé rapidement, mais pas de couture entre la boucle et la sangle, ce qui fait que mon chat a déjà fini par la faire tomber. Je vais l'arranger en deux temps, trois mouvements, mais un tout petit peu plate quand même ;) À part ça, vraiment super !